In 1865, George Hearst, a wealthy miner, purchased 40,000-acres of ranchland that included the Mexican Ranchos of Piedras Blancas, San Simeon and Santa Rosa. In 1919, his only son, William Randolph Hearst, inherited the land from his mother, Phoebe Apperson Hearst. By then the ranch had grown to encompass 250,000 acres. Originally known as "Camp Hill," its wilderness offered a place for family members and friends to "rough it" on camping trips. Despite elaborate arrangements with separate sleeping and dining tents, Hearst envisioned more comfortable accommodations. His simple instructions to famed San Francisco architect Julia Morgan in 1919: "Miss Morgan, we are tired of camping out in the open at the ranch in San Simeon and I would like to build a little something"
Hearst and Morgan's collaboration was destined to become one of the world's greatest showplaces. As they were planning and constructing his dream home, Hearst renamed the rocky perch from which it rose "La Cuesta Encantada" - The Enchanted Hill. By 1947, Hearst and Morgan had created an estate of 165 rooms and 127 acres of gardens, terraces, pools and walkways. The estate's magnificent main house, "Casa Grande," and three guest houses are of Mediterranean Revival style, while the imposing towers of Casa Grande were inspired by a Spanish cathedral. 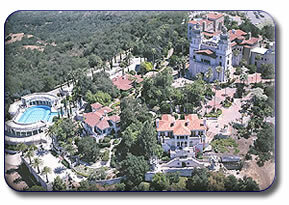 The blending of the architectural style with the surrounding land, and Hearst's superb European and Mediterranean art collection, was so seamless that world-renowned architectural historian, Lord John Julius Norwich, was moved to say that "Hearst Castle is a palace in every sense of the word."